InCONCERT New Year's Eve Party - Something to celebrate! InCONCERT New Year’s Eve Party – Something to celebrate! Are you looking for things to do in Richmond? Or a place to celebrate New Year’s Eve? Look no further than the Depot District and the 4th Floor Blues Club! InCONCERT series is celebrating another year of giving thousands of dollars to area non-profits! Did we say thousands? How about more than $35,000 to more than 10 local non-profits! How do they do it? By hosting events like the New Year’s Eve Party! 100% of every ticket sale goes back to the member non-profits like YMCA, Sunrise, Boys and Girls Club, Lyons Club and many others. If you are looking for something fun to do in Richmond on New Year’s Eve, the InCONCERT party at the 4th Blues Club is the place to go! Your ticket includes an all you can eat buffet. Enjoy party favors and of course we will have a champagne toast at midnight. You’ll love the sounds of Fingertrip band! FREE ride home within Richmond city limits, in the Blues Mobile. 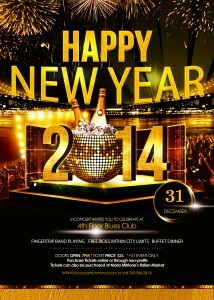 Don’t miss great food, drinks and music this New Year’s Eve! Visit www.inconcertrichmond.com for tickets! Tickets $25.00. Must be 21. Doors open at 7:00 pm.